Want to become a better speaker? Terrified of social networking events? Do you find yourself not knowing what to say? 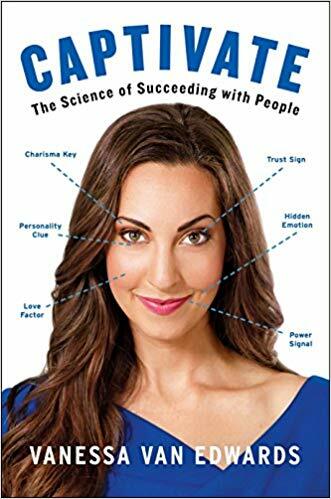 Captivate is a guide to overcoming social barriers and becoming successful in any social interaction, with science to back it up. Vanessa Van Edwards went from awkward to social superstar with a little help from vigorous research. She now gives speeches, stars in video lectures such as CreativeLive and Udemy, and contributes her and her team’s findings to a site called The Science of People. She has been mentioned in Fast Company Inc., Fox News, Forbes, and Men’s Health and has been a speaker at Fortune 500 pieces of training. Become a more interesting person by using conversation sparkers. Look for the other person's "hot buttons" in conversations. Remember people's names, once and for all. Practice assessing people's personalities using the OCEAN matrix from the Big Five. Figure out someone's appreciation language to give them the praise they crave. Figure out someone's values to know how to motivate them. Master the art of storytelling to connect with others. Practice telling at least one story to a friend daily. Get people excited and emotionally invested in your message with an explanation. Use the N.U.T. job to deal with difficult people in everyday life.